Sage words (as ever) from Chuck. If you’re even remotely interested in writing, get yourself over to his blog, sign up for his emails and buy his books. Right. I’m done waiting. Onwards. I’ve got ‘writer’ down in my bio on most places around the internet but I usually feel slightly fraudulent in putting it there. Then again, I *do* write. I write this, for example. I also do a mean line in email. I’ve written a couple of short stories which have been published and well over thirty thousand words featuring Monty, arch gentleman thief. Some of which ends up on here. I’ve ‘won’ NaNoWriMo, though the sheer effort of churning out 50 thousand words in 30 days left my writing mojo quivering in a dessicated heap, sobbing quietly to itself. I learned some lessons in the process, but I’m not sure I’ve entirely recovered from the experience. Whenever I read a great novel like Practical Magic by Alice Hoffman or A Game of Thrones by George RR Martin, the sheer gravitas to these books makes me want to shrink away and hide like the amateur I am. 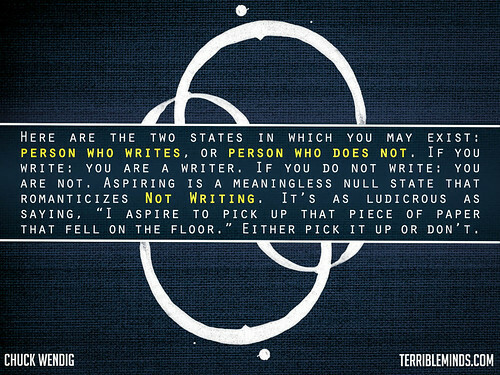 Which captures exactly how I feel about my writing. I’ve read a ton of brilliant books this year – Nick Harkaway‘s stunningly brilliant Angelmaker is just one example. I marvelled at the sheer scale and inventiveness of the ideas, and the beauty of the prose. There were sentences and paragraphs in there which I stopped and read and re-read several times just so I could savour them. Then I looked back at the stuff I’ve written, and it’s just a pale shadow, wilting in comparison. OK, I know it’s probably an unfair comparison, and I strongly suspect (nay, hope) that Angelmaker didn’t leap fully-formed from Nick’s head onto the page. His first draft probably sucked. Then I saw Chuck’s post this morning and was struck by the statement. Yoda summed it up neatly too. though I suspect that I’m one of the few people with actual physical copies of the publications in question. One was a very trendy artsy heavy-on-the-style magazine, full of beautiful people doing beautiful things, mostly wearing sunglasses indoors. One of *those* types of magazine. My name is Dave. 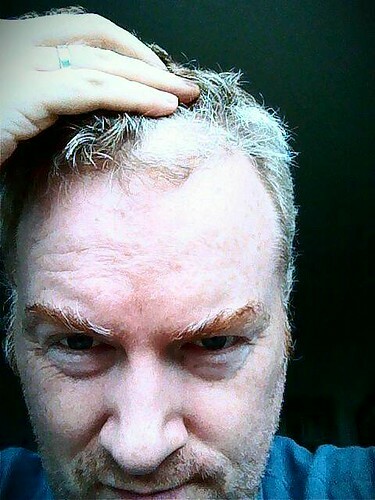 I’m a blogger, cyclist, photographer, writer, geek, juggler, caffeine junkie, the list of labels is as long as your arm. Married, father of two, the irrepressible EB and Ms LB. I go by the username dakegra online. It’s pronounced dah-keh-gruh, though I’ve heard it pronounced various different ways – dah-kee-grah, dake-grah, dake-gray. It’s made up of the first two letters of my first and middle names, and the first three of my surname. In my time I’ve studied astrophysics and information systems, worked as a librarian in a big law firm, designed and built automated workflow systems and mortgage forms, done a bit of coding, worked for various financial services companies and am now doing clever things with digital in central Leeds. I do a bit of writing – I’ve written a few short stories, including one *very* short one which was published in a very swish glossy coffee-table magazine. I’ve even ‘won’ NaNoWriMo, but only once. I like cycling too – in June 2012 I cycled 100km around London, at night. I’ve written a fair bit recently about bikes & stuff. I write about all sorts of weird & wonderful things. You may have noticed. This blog doesn’t really have a focus as such – I tend to write about anything that comes to mind. A mishmash of thoughts that fall out of my head, though there tends to be a fair amount of coffee, photography, books, bikes and allotmenteering. I set up this blog to talk about any and all of the above. You can also find me on flickr, twitter and other places around the internet. The title of William Boyd’s new Bond novel was announced today. 1969. A veteran secret agent. A single mission. A licence to kill. 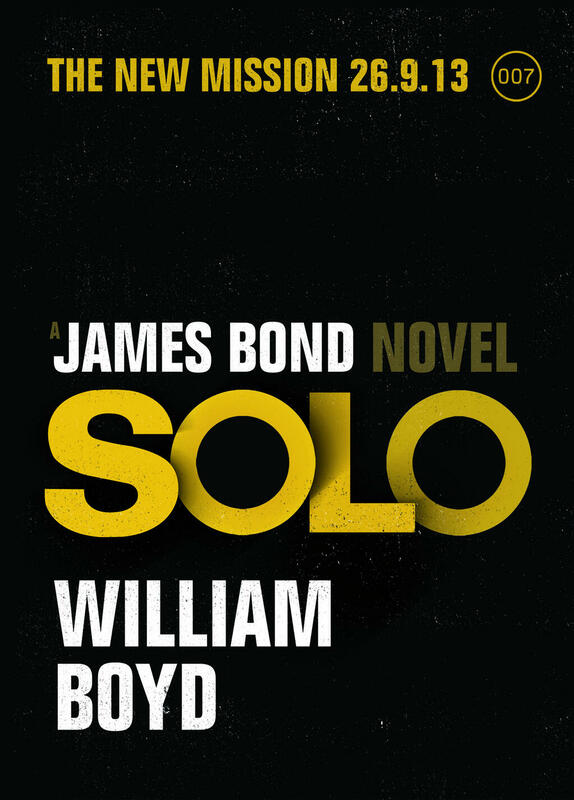 The last couple of Bond novels have been a bit lukewarm for me, but the idea of Bond going on a solo mission strikes me as an interesting idea. What do you think? Have you read any of the new (or indeed original) Bond stories? A short catch-up of the plan to read the Great Unread Book Pile. I’m eight books into 2013, and there have been some cracking reads in there. I’ve still got to write up full reviews for each, but Angelmaker by Nick Harkaway (@Harkaway) and The Shining Girls by Lauren Beukes (@Beukes) in particular were absolutely brilliant. I’ve kind of wavered from the TBR pile a little – I was lucky enough to get an advance copy of The Shining Girls from the lovely Hannah and Kate at HarperCollins (@KillerReads) which promptly bustled all other books out of the way and was devoured over the course of a weekend. Glorious stuff, time travelling serial killers and a girl who didn’t die. It’s out soon, so keep your eyes peeled. Angelmaker has also gone and won The Red Tentacle Award for best novel at The Kitschies. Congratulations to Nick on both the award, and his epic suit. Similarly ARCs of The Teleportation Accident, London Falling and Fade to Black also appeared. The first was so-so, with some lovely characters (well, brilliantly described and written characters), but doing… well, nothing that I could work out. Meh. London Falling, on the other hand, was superb. A darker, nastier take on the magical London scene, kind of a grittier Whispers of London. Can’t wait for the sequel. I finished Fade to Black yesterday. It was pretty good – interesting characters doing interesting things in a world that I’d not come across before. Again, there’s a sequel on the way and I’m looking forward to it. I’ve had a couple of other recommendations to investigate, but am (at the moment) being good and attacking the TBR pile once more. So, dear reader. What books have you read and enjoyed lately? Well well, dear reader. Here we are on day ten of #DaBloPoMo. It’s been going quite well thus far, I think. I’ve talked about a number of things thus far. On day 1 we had a chat about amusing spam, followed up by a post prompted by @LeedsBookClub talking about the film Labyrinth, in which you can see me playing with my ball. No, it’s an crystal juggling ball. Filthy minds, you lot. Did you watch the videos I failed to embed? Really, you should. Let me try again. Day 3 and I was playing with a pulp fiction cover generator. Then I talked about being a stationery geek. This post got picked up on The Pen Addict’s Ink Links and blog views went nuts. Well, relatively. Tons more views than usual. Still getting traffic now from it. Thanks Pen Addict! I had a chat about coffee, then rambled at length about ebooks and kindles. Another good post for views, that one. That led onto my love affair with books, prompted by Becs of Bits and Bobs Becs. She left a great comment on the ebook post too, with a link to a wonderful letter by Harper Lee. Following up the book theme, I looked at interesting things found inside books, with particular reference to something awesome I found in a lovely little book of poetry. Then yesterday I was a little ill, so left you with a photo of a tree. It’s been a busy ten days, dear reader. I’ve got a whole host of other things to natter on about in February. Watch this space! Dave’s Blog Posting Month. But then you knew that, right? ok, ok, it’s clear acrylic. Still looks cool. Inscription inside a copy of Robert W. Service’s ‘The Spell of the Yukon and Other Verses’, bought in Robin Hood’s Bay, Oct 2005. It’s a first edition, 1907. A small token given with every good wish, in grateful remembrance of a most pleasant trip. I love finding stuff like this in second hand books. This one struck me in particular as I was browsing through a tiny second-hand bookshop in Robin Hood’s Bay, a wonderful place in and of itself. The book caught my eye as Robert Service was a writer that my dad much admired. I’d picked up the book to leaf through it and on seeing the inscription, knew immediately that I had to buy it. Why? A couple of things. Not only was this a first edition in remarkably good nick for a book nearly a century old, April 24th was my dad’s birthday. 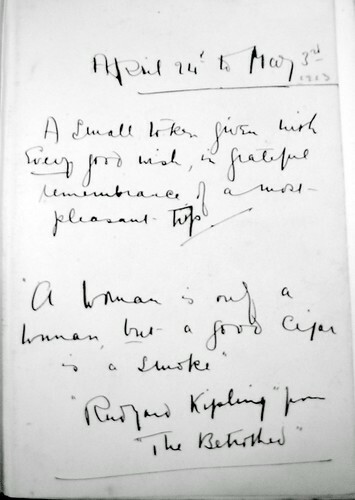 And the reference to Kipling – my in-laws lived at the time in East Sussex, in a little village called Burwash, where Kipling also lived. 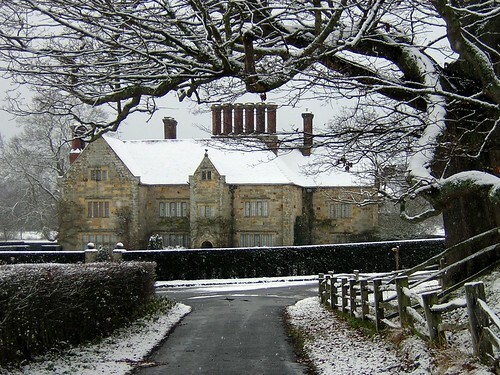 He had a house there called Bateman’s, which we’d walked the dogs past many many times. Kipling’s house dates back to 1634, about a hundred years after the wonderful house where my in-laws lived! 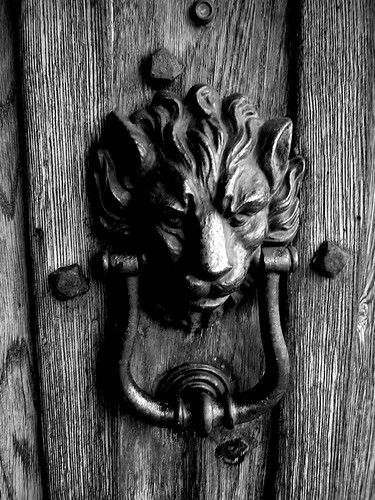 On a tangent (I’m good at them), this is Leo, the door-knocker on their house. Isn’t he a handsome kitty? So, dear reader. What’s the best/most interesting thing you’ve ever found in a book? Following on from yesterday’s ebook vs paperback debate, I wanted to talk about reading in general. I’ve always been a keen reader. I was reading before I started school and quickly exhausted the set reading books available, to the point where the teacher in my last year at junior school said to just bring in a book from home. I’d already been plundering my dad’s book collection – it was fairly small, consisting of books on the shelf by his bed and some in his office at work, but I soon picked up a taste for pulp sci-fi. 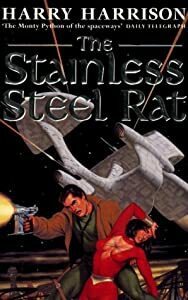 Harry Harrison’s The Stainless Steel Rat is still a favourite of mine, and I went through Edgar Rice Burroughs’ John Carter of Mars series in no time. Followed up with Asimov’s I, Robot, and his Lucky Starr -Space Ranger series, E.E. ‘Doc’ Smith’s Lensman books, the list goes on. I think my teacher was a bit alarmed when I turned up with a well-thumbed copy of one of the early Mars books, with their covers strewn with giant green aliens and bikini-clad heroines. Back in those days, books also seemed to be a lot thinner! I’d joined the local library too, and whizzed through books at a rate of knots. This was back in the days before computerised library issue systems, and each book had a little card ticket which went into a pocket in one of your library cards. I got told off by the librarian at the tiny local branch library (maybe 50 metres from our front door, bliss!) for reading too quickly, as I’d returned a book that I’d borrowed a couple of hours earlier and she hadn’t got round to filing the tickets yet! Luckily she took pity on me and gave me a couple of extra library tickets. My own bookshelves followed and were soon groaning under the weight. Then came the dream weekend job – working in a public library to make a bit of extra money, and getting paid to look after and talk to people about books. Great fun, and with a whole world of books at my disposal. Plus I got to persuade the librarians there to buy copies of a book I wanted to read, and got to read them before anyone else. I spent a few happy years working evenings and weekends in a variety of libraries across the city, from the tiny little local libraries to the bigger city branches. Had a weird moment one day working in Byker library when I realised that it was *exactly* the same design of building as my base at Fenham library, only with half the number of books. I’ve got a load of library-related tales to tell, but that’s for another day. The question I have for you today, dear reader, is about your early reading – did you start young, late, what sort of books did you like?